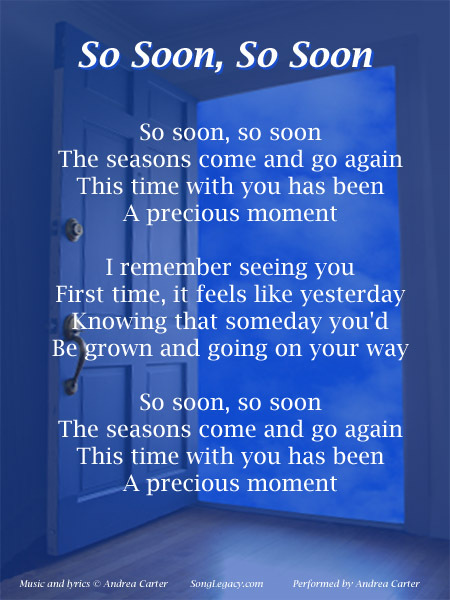 This original mother / son wedding processional song, So Soon, So Soon, is available as an MP3 download, along with an illustrated lyric sheet and CD jacket cover. You can use a music CD creation program to write the song on a CD and print the lyric sheet to include in the wedding book or frame to place on the wall. You can also print the CD cover image to insert in the CD jacket. This song would also be an excellent choice for a short mother/son dance song for the wedding reception. Andrea Carter is the composer, lyricist and vocalist on the recording. The playing time of the full-length song is 1 minute 21 seconds. 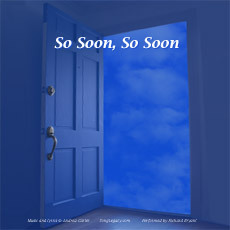 In addition to the MP3 file and lyric sheet, your purchase will include a higher quality version of this downloadable CD cover image created especially for this song. Click on the "Buy Now" button below to order your download of this original mother/son processional song in MP3 format, along with higher quality versions of the lyric sheet and CD cover illustrated above, for only $9.99. You must go through the PayPal checkout procedure to complete your order. We also offer personalized mother-son processional songs and other wedding songs with lyrics based on the lives of the people being honored in the song. See our Personalized Songs page or Contact Us for additional details. Please note that the products described on this page are MP3 files of an original song including vocals, along with an illustrated lyric sheet and a CD cover which can be printed. We do not offer sheet music or recordings of background music.